Thousands of people participated at the Great Heroes Day celebrations held at the Tharavai ‘Maveerar Thuyilum Illam’ (The martyr's cemetery where Great Heroes rest) in the Batticaloa district, despite heavy rains Thursday evening, and the Senior Commander of the LTTE for the eastern flank, Col. V. Karuna, attended the celebrations, sources said. In memory of the Great Heroes, business establishments in the Tamil regions of the Batticaloa district shut down and government offices did not function as there was only minimal attendance. Students did not attend schools, the sources said. 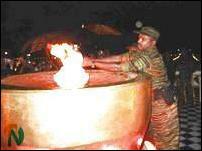 Col. Karuna lighting the flame of sacrifice at the Tharavai Maveerar Thuyilum Illam. As thousands of people and hundred of vehicles reached the main event at Tharavai through Kiran, traffic congestion could be seen in the village. For the first time this year, parents of the martyrs also attended the functions along with the general public. In Kiran, Santhiveli and Vantharumoolai, rest stops for the visitors from remote areas to rest and take refreshments could be seen. In Valaichenai, a public procession of people in a boat-like vehicle carrying a large cutout of the LTTE leader, Mr. V. Pirapaharan, reached the Vakarai-Kanadalady Maveerar Thuyilum Illam. Behind that vehicle were a large number of people in buses, vans, trishaws and tractors, the sources said.